This Federal style building has two stories, an asphalt shingle roof and has been minimally altered. There is a five-bay center entrance. It is wood frame and has a hipped roof. There is a brick center chimney and brick side wall chimney on the right side. It has wood clapboard siding; fluted pilasters at corners and a flanking one-story flat-roofed front entry porch with fluted Doric columns and a frieze with metopes and triglyphs. There is a door surround with a fanlight and fluted pilasters. There is a one-story porch off the left side of the house with lattice walls, Roman-arched openings and a stone foundation. There are 2-over-2 windows, authentic window blinds; a two-story rear ell and a two-story, three-bay-wide addition off the right rear corner with hipped roof. There is a brick rear wall chimney, a separate front entrance with a hipped canopy. LANDSCAPE: shrub arbor at entrance to front walkway; lattice screen fence in front of recessed right wing/ell. The original owners of this house were James and Maria Robbins. Mrs. Robbins’ maiden name was Egleston, and she was no doubt related to the locally prominent Egleston family whose members included Revolutionary War hero Major Azariah Egleston. The house was sold in 1850 to Ammi Robbins, who retained ownership until 1866. During this period the house was said to be a stop on the underground railroad. The house then passed on to John S. Schanck and Maria Robbins Schanck. In 1902 it passed out of the Robbins family when it was sold to Lydia E. Flint, who subsequently sold it to Louisa Ludlow in 1906. 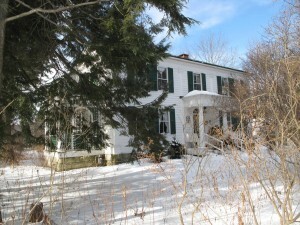 The house was known as the Ludlow Cottage for many years, and remained in the Ludlow family, passing on to Louisa Ludlow’s daughter, Mrs. John L.B. Brooke. In 2001, the house was transferred to her daughter Cornelia Gilder.